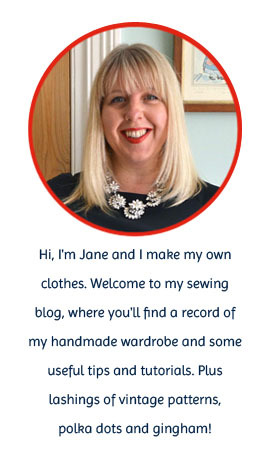 Handmade Jane: Supermum strikes again.....not! 1. Open wardrobe and find white shirt, blue jumper and white football socks. 2. Purchase a pair of brown shorts. 3. Toil away for several minutes, even as many as five, to sew elastic around the bottom of each leg. Can somebody pass me my award now please? can I just point out that Tintin is quite often shown carrying a revolver! Polish away! I think you earned it! Amazing, he looks brilliant (especially the hair). 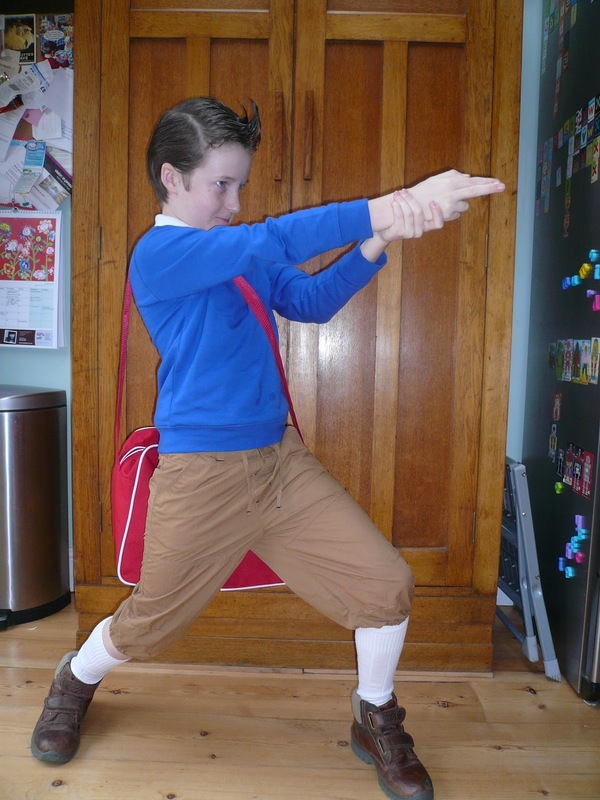 I loved world book day when I was a kid, what a treat. He looks fantastic! My 16 year old has gone in as a princess, it's very brave of her as she is very shy, goes to a large comprehensive and only the AS level English students are dressing up. I just posted pictures on my blog, it would be lovely if you took a peek. Great costume! Our Primary school doesn't do World Book Day, which is a bit of a shame. It's mine too, he looks completely mad! He looks amazing! I love the second picture too! 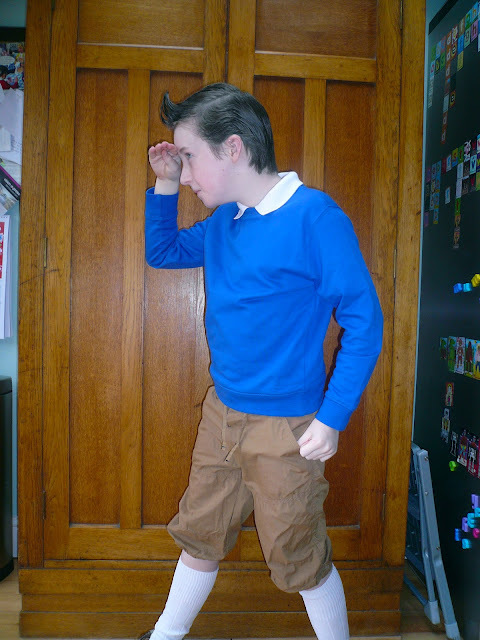 Hehe, he makes a great Tintin! Love the hair! I am almost in tears reading this because I am laughing so hard. Your son is super cute and very dramatic. And yes, you get the mom of the year award even if it only took 5 minutes, well done! Cool! your son looks great as Tintin, his hair looks super cool too! Of course you deserve an award! So cute! 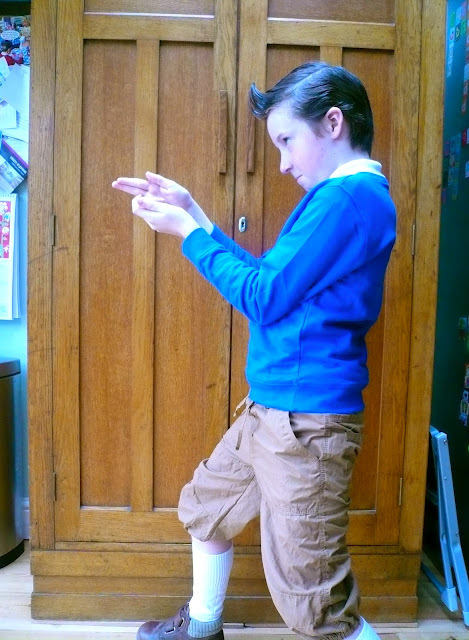 And presumably you can remove the elastics and have a pair of fully functional shorts - unless your son fancies keeping them as Tintin trousers, as he does rather suit the look! Ha! We have been through the same thing. My kids are dressing up tomorrow. After failing to persuade my son to dress as the character who wears jeans and a t - shirt, I found a piece of fleece the right width, cut neck and armholes and sewed shoulder seams he teamed it with a green tunic and green joggers and his sisters snow boots et voila Hiccup from How to Tame your Dragon. We get very resourceful don't we?! Oh you totally get Mum of the Year Award for that costume. I hope he gave you a big hug for that, he looks just like Tintin. We did ours today at school. Our headteacher came as "The Selfish Crocodile"....very funny. Loving your son's outfit, and you can sit back now with a very smug expression. Well done. Very cool. At schools here in Sydney kids dress up for book week as their fav literary character. Your son's costume would be a definite winner. He looks ace - what a great outfit - loving the hair! Polish your award super shiny - definitely no threat here!!! I did where's Wally. Jeans, red striped top, hat (which I knitted last year!) and glasses made out of cardboard. It would be awesome if one year, the school made that the theme. Imagine several hundred wallies and wendas. It really would be a case of finding your child! Reminds me of my brother's Tintin Halloween costume from a few years ago, I think when he was in high school? Though I think he elasticked his own pants. An excellent Tintin he looks like too. 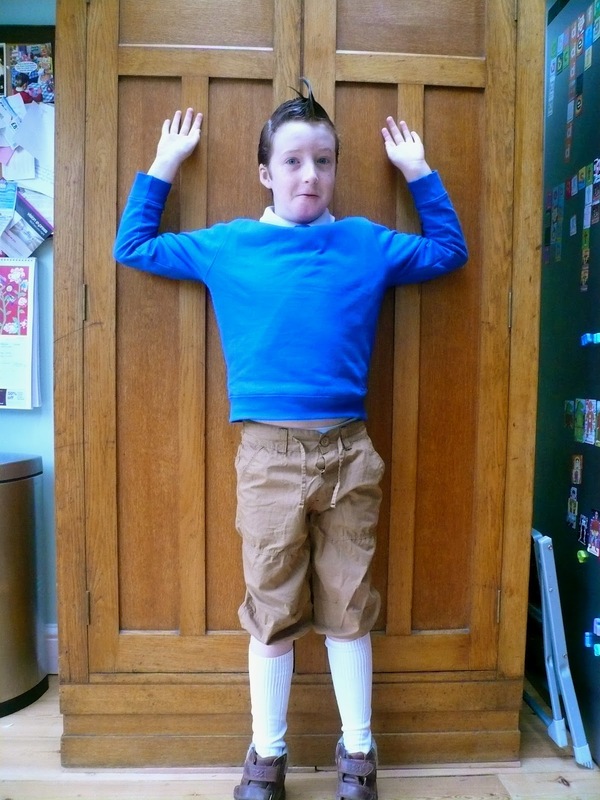 Many moons ago whilst still four my eldest couldn't be persuaded to be anyone other than Alfie and spent the whole day in shorts and wellies. Still over the years since I have made all sorts of costumes including some kind of golden lion once I seem to remember, can't recall what the book was though. What a great thing for your boy that his mom is so creative! 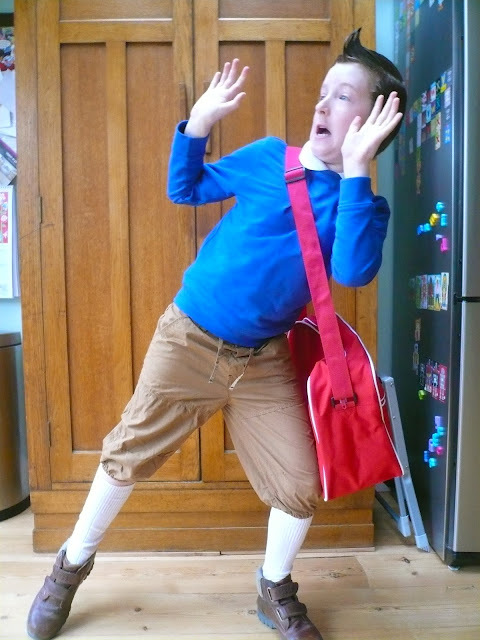 Hats off for the very authentic looking TinTin outfit - he looks fantastic and like you made his day.